All Medical, injury/illness, medications, vaccinations forms etc are built to meet the unique needs of the organisation whom is tracking the medical data. However, the following provides you with a guide to entering in new injury/illness data and then understanding where to update it from. Click on the Enter Data for Athlete button on the Home Page. If the correct athlete is not included in the list you may need to change groups, or e-mail your administrator to get them to update your group correctly. For this example we are selecting an athlete who is currently NOT injured/ill. For this example we are going to enter in a combined injury/illness record. -Pink Background: Any questions/fields that are highlighted in pink are required fields. This means you MUST enter information into this field or you will not be able to save your new record. -You are just entering the Initial injury/illness information. In most cases you will need to come back to this record to enter additional information such as the Date of return to play/training or the Date fully resolved or you will simply update their injury status from a SOAP table. Most systems are designed to accurately track injury/illness progression. 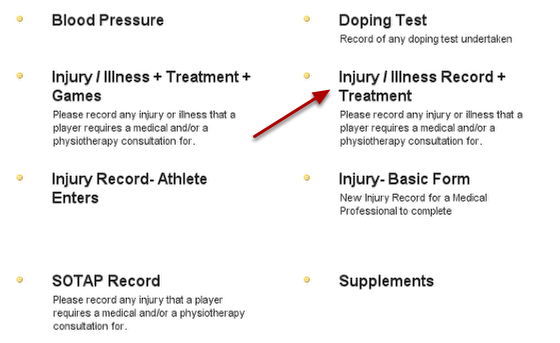 Each record that is not fully resolved will appear on your home page on the Current Injury/Illness Report. Additionally, the athlete's name will be coloured to reflect the status of the injury according to the record (red = injured/ill and unavailable, orange = injured/Ill but available, green = no illness or injury), so it is important that you update the record (e.g. availability and resolution of the injury) when the status of the player changes. -The type of information that you need to enter for each field/question is easy to interpret e.g. Injured/Ill During requires you to click and select an answer, and Injury or Illness Details is a blank line to enter text into. For MOST Injury/Illness forms, the Orchard Code Body diagram and Doctor icon is a required field (you must enter it). New Injury: if you are entering an Injury scroll your mouse/cursor over the Body Diagram and different areas of the body will be highlighted. 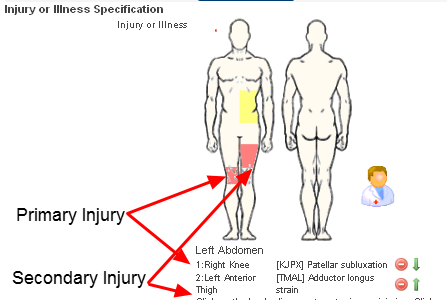 If you click on an area in the Body Diagram the injury classification/diagnoses will appear. New Illness: if you are entering an Illness, click on the Doctor icon and the illness classifications/diagnoses will appear. -You may have a separate Illness form depending on how your system is set up. If you do, you would select to enter the illness form on the data entry page. 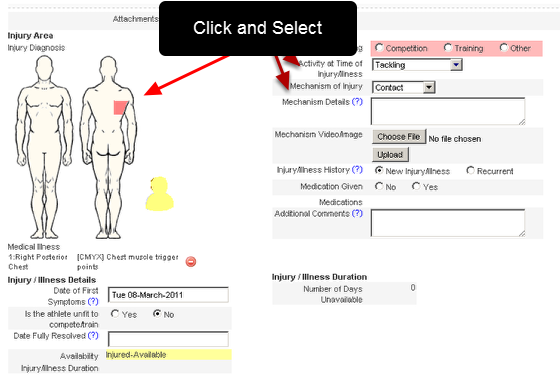 2: Once you click on an area in the body diagram or on the doctor icon a list of injury classifications will appear. If there is a black arrow to the right of the classification this means when you scroll over the classification a list of sub classifications will appear. The image here shows that the Right Anterior Thigh Injury classifications are broken down into Haematomas, Laceration/Abrasions, Fractures etc. When the Thigh Soft Tissue Bruising/Haematoma is scrolled over an additional list appears. You can select on Myositis ossificans thigh or Other soft tissue bruising/haematoma not otherwise specified injury diagnosis, or scroll over the Thigh muscle classification and then choose from the additional injury diagnoses list. 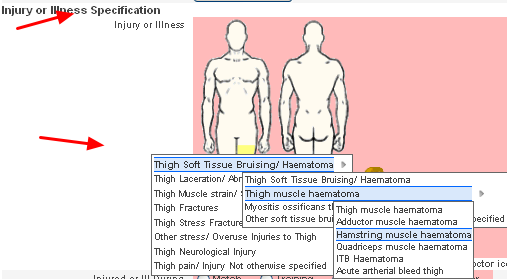 For this example, Hamstring Muscle Haematoma is going to be selected. 3: If the correct diagnosis is not available for that area/illness, click outside the body diagram/doctor icon in the pink coloured region and the current injury/illness classifications will disappear. Then select a different area on the body diagram and mouse over the injury classification to find the right injury diagnosis. 4: Once you have found the correct injury diagnosis click on the name of it. Please make the diagnosis as specific as possible so that your records show the actual injury/illness. 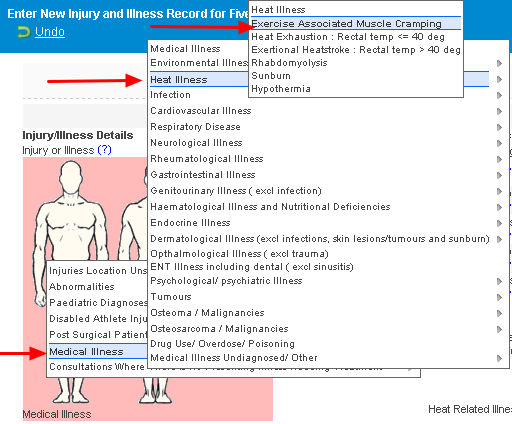 5: Once you select an injury/illness the Injury/Illness Code automatically appears at the bottom of the injury diagram. The injured area of the body will turn red, or the doctor icon will turn red (as shown in the image in Step below). 6: You can select up to three injuries for most injury/illness event record, but the injury at the top of the list will be recorded as the primary injury. The example here shows that the Medical Codes are designed to work the same as the Injury Codes. Simply mouse over the classifications and then scroll through the different Medical diagnoses to find the correct one. Once you select an injury diagnosis it will show under the body diagram. You can then add other injuries if you require (only if they are directly related to the primary injury and you feel that they do not warrant being saved as a new Injury Record). To move the injury or illness diagnosis up or down (e.g. to change the order of the injuries), use the green up and down arrows. Remember that the injury at the top of the list will be saved as the primary injury. Entering the additional Injury/Illness fields-these will all vary greatly depending on how your system is structured. All of the fields that appear for you to enter will have been tailored specifically to your organisation's needs. You maybe tracking data from recurrence to medications, or even injury mechanism. Complete the fields with as much detail as possible. Date of First symptoms is a common field. This is a date field and it will automatically default to today's date. However, you can enter in any date that you need, but please enter the date that the symptoms first appeared. You can select a different date by clicking on the date field and a date-pop-up-box will appear. Then, click on a different date (as shown on the return to availability to play date field) e.g. if the player has had symptoms for several days before presenting to you please enter initial date symptoms began. Unavailability is a common field e.g Did this injury or illness render the player unfit to practice fully and be unavailable to play. It is a Yes or No field and it is automatically defaulted to No. - Date first unavailable for practice or match. Click on the date field and select the date that the player was or would have been first unavailable from the pop-up calendar. Please note that you cannot enter a date that occurred before the Date of first symptoms. - Expected number of days unavailable (expected number of days unable to compete or train). Please write in the number of days you expect the player to be injured and unavailable for play/practice. This is a whole number, so enter in complete full days. 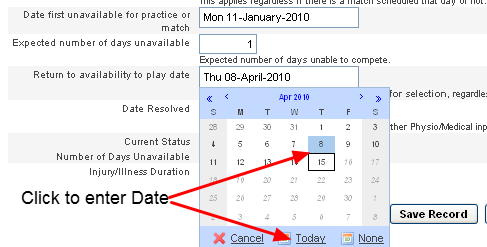 If the player is (1) Not available for practice or match and/or (2) the injury or illness is not fully resolved, leave the Return to availability to play date and/or Date Resolved fields blank/empty. The (1) Return to availability to play date and (2) Date Resolved are only entered when the player actually returns to play or train injury free, or when the injury is fully resolved. YOU CANNOT ENTER IN FUTURE DATES. These fields must be updated when a player actually become available to play or train again. (1)	Return to availability to play date is the date the player first becomes available to play or train with no restrictions, regardless of whether a match or training is scheduled on that date or not. You cannot enter in future dates e.g. if you expect the player to be available in two days time you cannot complete this field. You will need to update this form once the player actually becomes available. When a date is entered into this field the player will be recorded as Injured/Ill-Available (Orange). (2)	Date Resolved is the date that there is no requirement for further Physiotherapy/Medical input. When a date is entered into the date field the injury/illness can then be closed and will not require additional information. The player will be marked as Available (Green). The Number of days unavailable and Injury Duration are automatically calculated once the Return to availability to play date and/or date resolved fields are entered. 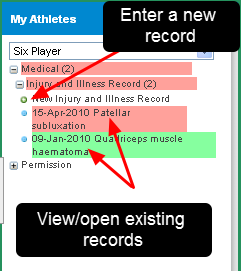 Click in the "Assessment Date" cell and select the date that you assessed/treated the player. Select the "Today" button at the bottom of the calendar pop up and the date on the day of entry will be shown, or Click "None" to remove any date from appearing in the calendar assessment date. The example here shows that the physio/doctor is entering in the players subjective information. When you have entered in the appropriate information click "Save Record" and the new injury/illness will be saved. Do you have another Injury or Illness Record to enter? To Cancel saving the record and all of your information click on cancel. Click on the player that you want to enter the new entry for (e.g. Player Ten). A new injury and Illness record form will appear to enter for the selected player. N.B. If you clicked on the wrong player and the form has already opened, just click the cancel button at the bottom of the record and no information will be recorded. On your home page, your administrator should have created a front page report to highlight all of the injury and/or illness records that are currently marked as open (not fully resolved). To update an existing record, simply click directly onto a row in that report. If you do NOT have a report, you can set one up yourself by following the Reports- Home page reports lesson, or by contacting your administrator. Enter in the appropriate return to play information, or Update the SOTAP table and select "Save and Close"
Click on the Add Assessment button at the end of the table row and then enter in your assessment information for a different date into that new row. If you have your injury status fields included in your SOTAP table you can update it as shown here. Enter in your SOTAP notes and Click "Save and Close " or "Save and Lock" depending on the status of your player. N.B. All rows will be locked 24 hours after they are entered ensure the safety of the data. Most systems will be set up so that you can see your SOAP notes underneath the injury/illnes record in the sidebar. The example here shows that the SOTAP note was entered on the 4th November, and if you hold your mouse cursor over the date field, the actual SOTAP note appears for you to review without having to open the injury. On the left of the page you will always have access to the My Athletes Sidebar. You can enter new injury/illness records, or update the status of existing records directly from this sidebar. You can click on any of the athlete's name to be taken to their history in the steps below. For this example we are going to select Player Six. To see the list of events entered for a player, click on the + beside the players name to expand the list of events. 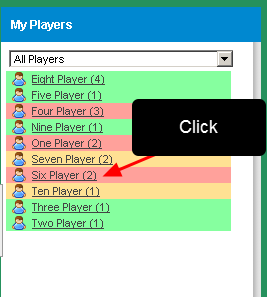 In this example Player six is coloured Red because they have an unresolved injury that has made them unable to train/play. You can also see that their injury on 9 January is fully resolved (Green). The injury from 15 April is not fully resolved and is red because the player is currently unable to play/train. -To update the 15 April record, you could simply click on it in the sidebar and it will open in the main window, ready for you to edit or update. -To update that record, you could simply click on it and it opens to be able to be entered. All Fully resolved entries can also be opened to be viewed, but they cannot be edited because they are locked. -Click on “New Injury or Illness Record” to enter a new record for that player. Next: All Images attached to an Image Field Types now appear as a Thumbnail in the Event Form.